Sunny to partly cloudy. High 97F. Winds NW at 5 to 10 mph..
A clear sky. Low 61F. Winds NW at 5 to 10 mph. 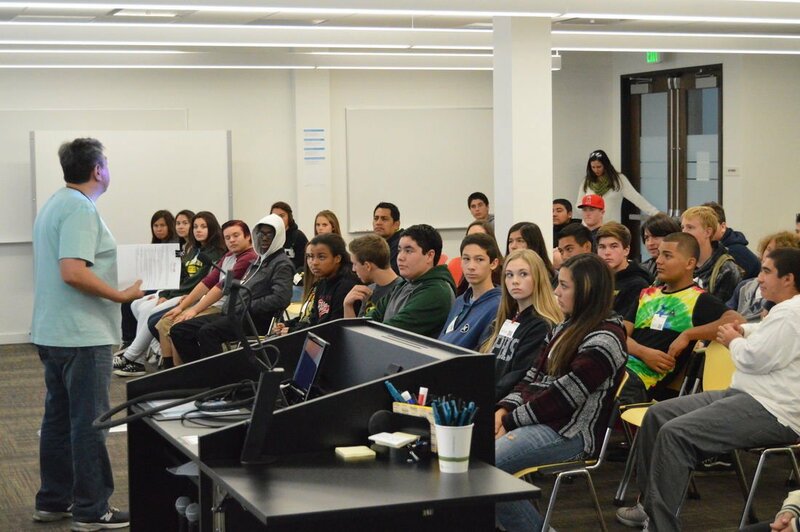 Sierra Pacific High School students listen to a presentation at the Google headquarters in Mountain View during a field trip last week. Sierra Pacific students participate in a Q&A with Google employees during a field trip. The lobby and adult slide at the Google campus in Mountain View is shown during a field trip last week. A Google phone booth is shown during a student field trip to the campus in Mountain View last week. Last Thursday, sophomores in the Sierra Pacific High School business pathway program got to go on a one-day field trip to the Google headquarters in Mountain View, known as the Googleplex. The students got to go on a tour, participate in a panel with employees and more. Isquierdo said the Google headquarters has an adult slide going from the second floor to the bottom floor, a volleyball pit, more than a dozen cafeteria areas, gyms, a sports complex, self-driving vehicles and more. Students were able to tour all of these areas and meet with some of the people who work for the company, often called Googlers. As part of a special two-hour Q&A panel, several Googlers gave a presentation to the students on what it takes to work there, what kind of salary and benefits you could expect and what kind of people they’re looking for. “What it did for me is it transformed the impression of an unattainable job designed for the best computer coders of the world to a phenomenal yet attainable position that offers opportunities for various backgrounds and career interests,” he said. Isquierdo said the school has wanted to do a field trip to a company in the tech field for the last few years. It was decided that Google would be a good choice because they are at the forefront of the field. “I wanted the students to walk away with clear, distinct impression of what a real innovative, creative work place looks like,” he said. However, it is company policy that visitors can only tour the facilities if they know someone who works there who is willing to host them. That wasn’t possible until this school year, when it was discovered that one student has an uncle who works as a finance director at the company. Isquierdo contacted him, Hanford native Jesse Haro, and the two hit it off. Isquierdo said Haro was open to the idea of supervising a tour and the school began planning for the trip over the past few months. Haro wasn't available for comment Tuesday. Evan Duran, a student at the school, said he really enjoyed the experience of seeing the Google complex. Duran said he enjoyed the tour the most, as it allowed him to see a lot of different areas of the campus. He said Google made it fun by making it like a scavenger hunt in which students had to figure out clues and end up at significant landmarks in the complex. Duran said he is interested in eventually starting his own business but said after the trip he would definitely be interested in working there. Fellow student Meghan Verheul said she also enjoyed the trip and was surprised by how relaxed everyone was. Isquierdo said that getting students to consider the possibilities was one of his main goals with the trip. Isquierdo said he would like to see Google trips become an annual thing for the students if Google is willing to participate. The Sierra Pacific High School business pathway program involves the students taking four years of business-related classes with the goal of preparing them for careers in the field. The reporter can be reached at 583-2429 or jluiz@hanfordsentinel.com. You can also follow him on Twitter at @JosephL_HS.